This lasagne could not have turned out any better!! I mean just look at it! I used to make my lasagne with a topping of mozzarella thinking it would make the lasagne more cheesy and lovely and gooey than using a more traditional parmesan cheese topping. How wrong was I!??! The traditional done by the Italians should stay just how it is....duh, of course! Enjoy alone or with a side of caesar salad and some garlic bread. 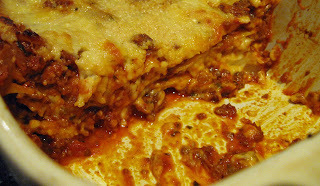 This lasagne got me plenty of "mmmmmmm's", so the recipe will definitely be a keeper and repeated and repeated and repeated.....yumm!